I haven't checked the EQ website for a while, but have now discovered they offer GICs at very competitive rates. See below. Unfortunately, for whatever reason, they still do not offer joint accounts. Thanks, gicjunkie, you are a fount of knowledge! Thanks for the tip. Just last week I'd been checking whether they had GICs. I'll add them to the new GIC comparison chart! What's the minimum deposit required? Maximum 5 GIC's per customer. * For GIC terms equal to one year, simple interest is calculated on a per annum basis and paid at maturity. 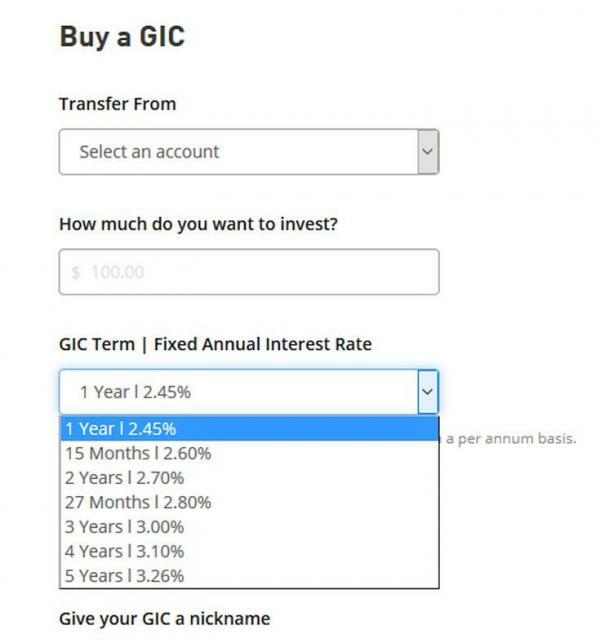 For GIC terms of over one year, not including 15 and 27 month terms, interest is calculated on a per annum basis and, depending on the selection made at the time of purchase, paid either annually (simple interest) or at maturity (compounded annually). For GIC terms of 15 and 27 months, interest is calculated on a per annum basis, compounded annually and paid solely at maturity. In all cases, interest is accrued for the entire GIC term. Nice to have more gic options. Competitive rates also. Just tried it now. The EQ Bank GIC web page is still there. Introducing GIC offerings suggests they have no serious interest in ever providing joint accounts. Very disappointing. That rocks. I was waiting for EQ GICs. Equitable Bank has always had GICs in the broker channel. Looks like the EQ retail flavour is those rates plus roughly a quarter point (the commission in the brokerage channel). The 5-GIC-per-customer restriction is interesting, anyone seen something similar before? No, I've never seen such a restriction. It makes it look like they are trying to push people into a tidy five year ladder @ 5 x 20-100K. But most people probably won't do that unless EQ should decide to market it that way. I believe they also have a 100K limit on their savings account, so it is a consistent approach. With that limit, I thought their goal was to broaden their customer base as much as possible. This may still be the case. They probably think that if you have more money than that, you should be or soon will be at a brokerage. 500K may be a maximum, but only 100K including any compounded interest is insured by CDIC. That 100K must also include whatever you keep there in a savings account or might keep there in future. Since EQ offers the highest standard rate for savings, this may limit a lot of people, or at least provide them with a dilemma. With EQ's stubborn refusal to provide joint accounts as another limitation, these GICs may not be as useful as they at first appear. If you're maxed out here in emergency savings (or nearly so), then you don't have any insured room for these GICs. Remember that during the Home Capital (Oaken) financial crisis last year, EQ seemed to be the next most vulnerable FI and took steps to bolster itself to ward off a run on savings. Personally, I would not consider going over the CDIC limit with EQ, and, since I do use their savings account, there is not much room in this for me right now. However, it's good to see more options emerging. GICs are more stable deposit base than savings, makes sense to try to get people to move from savings accounts into GICs. Just out of curiosity, are you people being presented with the same GIC rate deck that I was just flashed when I looked into it? (see attached partial screenshot). Same rates for me, same as gicjunkie originally posted. What makes you wonder whether different customers are being shown different rates? Geez. We live in a world where FIs send out mass emails when they get the photocopier fixed or the office goldfish has a birthday. And yet, EQ launches GICs without any outreach. Either they are outrageously bad at marketing -- I mean, lives could be at risk with that kind of incompetence -- or they don't want people who've parked significant savings in their HISA, and have no intention of moving most/all of it for at least the next 12 months, to know that they could be earning more than 2.3%. When EQ started up they spent a lot of dough on TV ads, etc and ended up with too much business at once. And when you go into their login page now it flogs their GICs. So maybe this time they're trying a more viral, no-cost approach and letting the business come in at a more relaxed pace. Plus maybe what they're really targeting, at least to begin, is people in their own HISAs that will move it to a locked-in product - maybe not a bad idea when rates are expected to increase. So true about the goldfish birthday! EQ may indeed be trying to pace themselves. However, if their target is their existing HISA customers, there are two problems. First, they haven't sent any email to me, a customer; and,second, they ought to be looking further afield as many of their existing customers will already have maxed out their CDIC insurance and may need to kep th funds in HISA for various reasons. I suspect they may be holding off until a weekday to make it more public, so they will be fully staffed to manage it. Also, they may be just testing it out right now, to make sure the system works. Oaken's model has always been to focus on GICs, not much on the savings account. That may actually be the better strategy for the long term.